Our amazing New Year Sale Event has now begun and we have some fantastic savings for you all. Now im sure we are all feeling the pinch after Christmas, so we at Apacheonline have some brilliant savings for you in our New Year sale Event. We are also offering everyone an amazing 10% Discount Code for all New Season Styles. Simply enter NEWYEAR1 at the checkout of Apacheonline to receive 10% Off New Season Styles. Here are now a few examples of the amazing savings you can bag at Apacheonline, but remember, when they’ve gone, they’ve gone! First up we have this fun T Shirt from the lads at Duck and Cover. 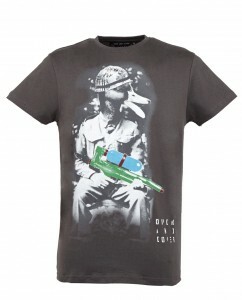 The Howden Super Soaker T Shirt is crafted in 100% Jersey Cotton and features a fun Duck Logo Print. Originally priced at £30.00, you can now pick this up for a mere £15.00, thats 50% Off! Next up, we have this bobby dazzler of a shirt from the guys at Fred Perry. 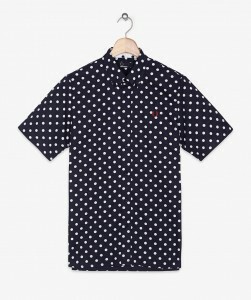 The M5219 Polka Dot Shirt is made from a 100% Cotton fabric and features a bold polka dot design. Priced at £70.00, you can now pick this up for just £35.00 with a juicy 50% Discount. 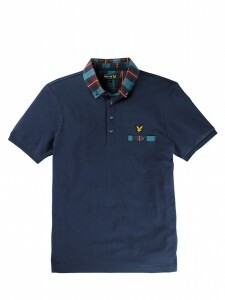 Now we have this classic polo shirt from the guys at Lyle and Scott. The SP106CL Tartan Collar Polo Shirt is made from 100% Pique Cotton and features a bold tartan collar. Originally priced at £60.00, this is now available at Apacheonline for just £30.00! 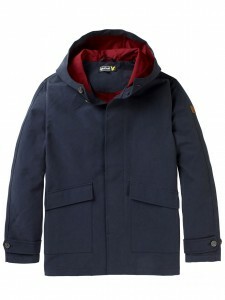 Now its getting even colder, we also have some fantastic Half Price Jackets, and here is an example from Lyle and Scott. The JK027CL Hooded Twill Jacket is a great style for these cold days and nights. In a quality cotton twill fabric and subtle sleeve branding, this will definitely keep the chill off. Priced at £130.00, you can now save 50% and get it for only £65.00 at Apacheonline.co.uk. We would like to take this opportunity to wish all our loyal followers and customers a very happy and prosperous new year and all the best for 2015. Also don’t forget our amazing 10% Discount Code NEWYEAR1 which can be used on all New Season Styles at Apacheonline. Make sure to keep checking the blog and website, as all the New Season Spring Summer 2015 deliveries will be commencing next week. Happy New Year from all at Apacheonline.